Dilute 1 part E-Z BRITE to 75 parts water for mildly oxidized surfaces. Increase concentration for severely oxidized surfaces. Always apply from bottom toward top, both on application and rinse. Allow E-Z BRITE to work for several minutes before rinsing. Do not allow surface to dry before rinsing. May be used in pressure washer, automatic type washers or applied by hand brushing. Keep off roof of trailer, paint, glass, ceramic, anodized aluminum as it can damage these surfaces. For best results clean surface first with E-Z KLEEN. For polished surfaces, use MIRROR X. 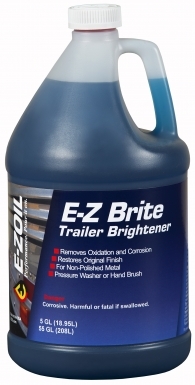 The best concentrated acid trailer finish brightener, E-Z BRITE uses a high-performance formula to clean and brighten non-polished metal exterior surfaces. For heavy-duty exterior non-polished metal finish restoration, reach for E-Z BRITE!